Earl Sweatshirt performs in front of fans. 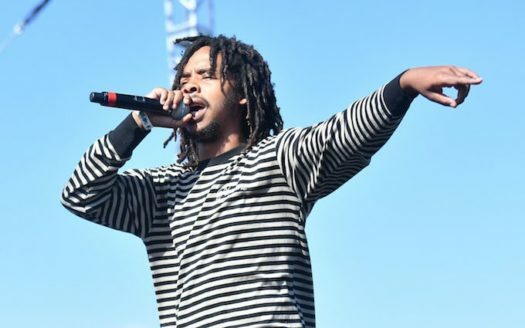 In November, Thebe Neruda Kgositsile, also known as Earl Sweatshirt, released his third studio album entitled “Some Rap Songs,” a critically acclaimed experimental hip-hop album that dealt with very personal issues of Kgositsile. “SRS” (Some Rap Songs) was a new artistic take for Kgositsile. The beats were still just as simplistic as before, but this time the looping was even harsher. The harsh looping is established right at the start with the song “Shattered Dreams.” The beat is simply sampled from the start of a song of the same name by The Endeavors. The next song “Red Water” is so looped that it just sounds like Earl made a hook to the song and just repeated it four times. Another noticeable feature of Kgositsile’s beats is that the use of vocals in the beats were plentiful. Songs like “Shattered Dreams”, “Red Water”, “Ontheway!”, “The Bends”, and “Veins” all have vocals laced into these looped beats. “SRS,” along with looping, also likes to mess around with mixing. This is shown quite well on “Nowhere2go” where Kgositsile is mixed a bit low allowing for the music to wash over him. Kgositsile just pops in and out of the song to put out some pretty depressing lyrics. These sound like criticisms, but the mixing is used in an interesting way at certain times. Kgositsile puts out a lot of intense topics on “SRS,” like his relationship with his father, drug abuse, relationships with friends, and isolation. This is done in an abstract way, not really telling you what he means. One instance would be on “Cold Summers” where Kgositsile states “Three spliffs my wings clipped, I was stuck in the hanger” and “muzzle my pain and muzzle my brain up”. Kgositsile is able to explain his drug problems in a poetic way, making it engaging to listen to. Then there are instances where it is pretty direct. Like on Nowhere2go “Yeah, I think I spent most of my life depressed only thing on my mind was death”. No matter if Kgositsile is explaining the situations poetically or directly, the album still keeps listeners interested in what he has to say due to the topics being so intense and emotional. Another difference between “SRS” and previous records is the delivery. Originally, Kgositsile came from the rap collective Odd Future, a group known for being youthfully energetic. While Kgositsile had one of the most stone-cold deliveries out of the group, he still had this energy on his albums like “Doris” and “Idlsidgo” (I don’t like sh** I don’t go outside). When fans get to “SRS,” the delivery is mostly laid back and chill. This lack of energy is almost scary for Kgositsile. On “Idlsidgo,” the topics gave him this energy on the tracks, but on “SRS” the delivery almost sounds like he has given up on life. The brevity of this album is something that adds so much to it. “SRS “stands at a runtime of twenty-four minutes and thirty-nine seconds. It could lead some to believe the album wouldn’t have enough time to get across all of its concepts, but “SRS” pulls it off. The to-the-point lyrics allow for concepts to be covered as much as needed and then the song smoothly washes over into the next song. Most tracks don’t even go over two minutes in length. The tracks still feel like full products even with such short runtimes. This project has been an artistically defining moment for Kgositsile. While you can still hear his influences within his music, SRS isn’t the most original sounding album yet. Kgositsile is still able to set himself a permanent spot within hip-hop history as one of the most interesting abstract rap artists.